Years ago, Jeff Lynn met his destiny on a trip to Italy. 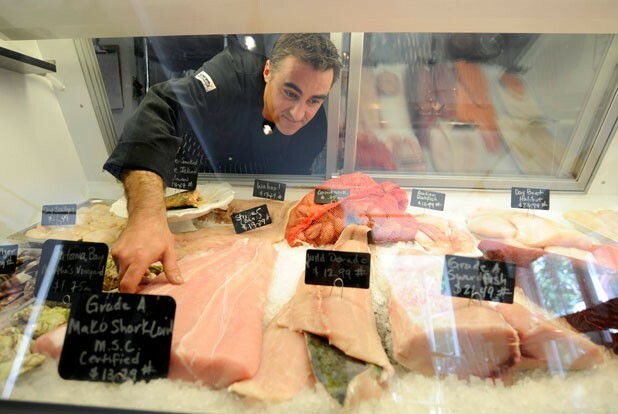 The New England Culinary Institute-trained chef considered himself a fish specialist, but visiting a small salumeria in that country opened his mind. “It was just outside Tuscany, and it was a tiny, tiny place. I just remember the smell, the look of the place — it was really neat,” Lynn recalls. When he moved to Warren 15 years ago, Lynn dreamed of opening a similar store in the area. But it took a spate of bad weather in Vermont — really bad weather, in the form of Tropical Storm Irene — to motivate him to make the dream reality. Following the storm’s devastation in Waitsfield, Jason Gulisano closed his Green Cup Café at 40 Bridge Street, and the Gulisano family rebuilt the site, turning it into something of a food hub. The sprawling building now holds bakery Sweet Simone’s and ice cream parlor Scout’s Honor under the collective banner of the Sweet Spot, as well as the rustic, Euro-style restaurant Peasant. By the fall of 2012, there was only one space left. Over dinner at Peasant that fall, Lynn told his wife he wanted to take over the space next door and finally realize the idea he’d been harboring for so many years. On December 14, he opened Bridge Street Butchery with a counter full of the best foods the Mad River Valley has to offer. Fresh fish and meats are available for home chefs to prepare however they want, but Lynn’s biggest sellers include marinated fish, homemade sausages and local veggies. It’s a one-stop shop for the Valley’s growing gustatory bounty. Good relationships with other local businesses are at the core of Bridge Street Butchery’s success, Lynn says. Suzanne Slomin’s airy, tangy levain breads, formerly sold at Kingsbury Market Garden’s farm store, now fly off the shelves on Thursdays, Fridays and Saturdays. A cheese case is packed with whole wheels of fromages from nearby von Trapp Farmstead and other Vermont cheese makers. When he worked at the now-closed Sweetwood Grill & Bar in Warren, Lynn was the first chef to cement a relationship with Ethan Wood of Wood Mountain Fish. Wood now makes regular trips to fill Lynn’s case with baby octopus, Acadian rockfish and whatever delicacies Massachusetts fishermen have to offer. Lynn’s mother, Suzee, a former nurse, staffs the Butchery’s counter. One of the store’s trademarks, she says, is that customers get a fresh lemon with each purchase from the fish case. This reporter uses hers to make a lemon-cilantro beurre blanc with day-boat cod purchased at the butchery. The fish is exceptionally fresh and meaty, as it is at top-flight restaurants and the few other Vermont retailers that Wood supplies, including South Burlington’s Healthy Living, Burlington’s City Market and the Woodstock Farmers Market. On a recent Thursday, Lynn fires up the grill in the grassy area out back of the store overlooking the Mad River. At lunchtime, tables out there fill up with diners enjoying sandwiches made from house-roasted beef or imported Italian cold cuts. Today, the marinade has been permeating a big, meaty slab of swordfish. Lynn serves it grilled over what could best be termed a baby Caprese salad, with tiny cherry tomatoes, pearls of Maplebrook Fine Cheese mozzarella and finely chopped basil. For his own lunch, Lynn enjoys a rustic, Basque-style stew composed of lobster, shrimp, littleneck clams and baby octopus in white wine and lobster stock reddened with pimentón. “He’s a good chef, isn’t he?” asks Suzee after our shared meal. That ambiance of motherly warmth helps make 40 Bridge Street unique. Lisa Curtis, co-owner of Sweet Simone’s, knows what it’s like to have mom helping out. Her parents, Sam and Barbara Gulisano, live in the building. Add Peasant co-owners Chris Alberti and his wife, Mary Ellen, and it’s one big, happy family on Bridge Street. Happy, that is, so long as there are no more destructive storms. Given the building’s history, that threat always looms. During lunchtime on a recent weekday, Sam Gulisano walks along the picturesque plot abutting the Mad River with a troubled look on his face. He hasn’t needed to put down sandbags since last fall’s Hurricane Sandy, but with warnings of an impending four inches of rain following the near-constant deluge in recent weeks, Gulisano and his tenants fear the water may have nowhere to go but up. Fortunately, no damage ensues this night or the following week — though Lynn says another hour of rain probably would have caused a flood. The frequent alerts for a fight-or-flight response have forged bonds not just among the denizens of the building but among all the business owners on Bridge Street. “I’ve never worked in an environment like [this],” Lynn says of the interbusiness cooperation. Bridge Street’s foodie enterprises have another thing in common: a desire to support the agriculture of the Mad River Valley. The butchery recently began selling pots of lettuces and herbs from local farmer Dave Hartshorn’s latest project, Green Mountain Harvest Hydroponics. More veggies are still to come from Waitsfield’s Small Step Farm. Over the winter, that produce is likely to appear in the form of pickles similar to those the butchery currently sells, such as sweet-and-spicy ramps and crunchy dilled carrots. For all the vegetables and fish it sells, the store is, as its name indicates, primarily a butcher shop. 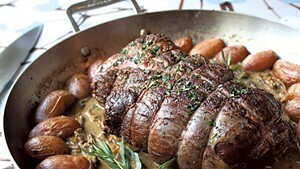 Ironically, Lynn says his biggest challenge has been sourcing local meat. “The slaughter schedules never match when I need it,” he laments. Part of the problem is that Lynn’s business model rules out freezing anything: There’s no freezer in his part of the building, and he plans to keep it that way. That’s not a problem when his entire inventory turns over every two days, Lynn says, but remaining fully stocked can be an issue. He often relies on such high-quality out-of-state farms as California’s Niman Ranch for cuts he can’t get locally. One of Lynn’s steadiest suppliers is Vermont Whey Fed Pigs, just up the road at von Trapp Farmstead. The well-marbled porkers provide the meat for his rotating variety of sausages. Fresh Italian links (both sweet and hot) and garlicky bratwurst are among the most popular, but the butchery also focuses on dry curing, just like that inspiring Tuscan salumeria. Lynn’s summer sausage blends the pork with local beef for a creamy burst of smoky fat. His toothsome soppressata is flecked with big chunks of black peppercorn. Long Island duck-breast prosciutto is aged in the refrigerator for 90 days yet remains almost as soft as fresh meat. These provisions, along with grainy mustard, Slomin’s bread and some of Lynn’s pickles, make it easy for home cooks to assemble a restaurant-worthy butcher board. The butchery’s appeal hasn’t been lost on locals. Next door at the Sweet Spot, John Vitko of Scout’s Honor Ice Cream says for impromptu entertaining, he’ll run over to the butcher shop for fresh oysters. After a long workday, he’ll pick up Faroe Island salmon for dinner with his family. The original print version of this article was headlined "Making the Cut"